Who is Slowpoke? - Slowpoke Well - A Pokémon Collection Site! Slowpoke Well - A Pokémon Collection Site! Number 79 on the National Pokédex, Slowpoke is a pink, sloth/otter-like fishing Pokémon. Like the name suggests, Slowpoke are a bit slow in the head -- which is why they're classified as the "dopey" Pokémon -- but can be faster than expected, once their synapses start firing. The challenge is getting there! It can take them minutes before they register pain. Slowpoke are content to lay around lakes and fish using their special tails that secrete an alluring (sweet? ), but not poisonous or nutritious, substance to the waterlife. Slowpoke are both water and psychic type. Because of their special tails, Slowpoke are often hunted in the Pokémon world to have their tails harvested for profit. One interesting thing a lot of people don't think about is the size of Slowpoke. People tend to believe they're smallish housedog-sized. However, just standing on all-fours, the average Slowpoke measures 3' 11" (1.2m) high. They're pretty massive! Interesting trivia: Slowpoke originally had stomach-stripes! It seemed like the artists could not decide whether or not he should have them, so you'll see a lot of older OFFICIAL art of him with stripes! In the original Silver version (the sprite where he's rolled over), there are regional differences to Slowpoke. In Japan, Slowpoke has stomach-stripes, but in the US, he has a plain pink belly! You can also see the very corner of it in his Gold sprite, too. I wonder why it was changed? I thought he was cute with the stripes. Slowpoke also have one of the most interesting and unique evolutions in the Pokémon world. Slowpoke in the wild can't change on their own-- but instead require assistance from another Pokémon, Shellder. Being the fisherman they are, they will sometimes catch a Shellder (or other Pokémon) with their tails. When this happens, the Shellder becomes a giant coiled shell and stays on Slowpoke for transportation. Shellder's newly developed teeth secrete a numbing toxin, so that Slowpoke won't feel the pain of the bite. 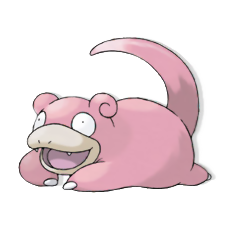 In return, Slowpoke is able to stand on it's hind legs, and free the use of it's front arms for different attacks. Really, Slowpoke didn't change at all, but the name changes from Slowpoke to Slowbro. It's a symbiotic host relationship, as Slowbro is able to learn new and different attacks, while Shellder has a free ride and free food that Slowbro shares with them. An evolution of two Pokémon! And with Slowpoke already being pretty darn big, while standing straight up Slowbro measures 5'03" (1.6m)! But that's not all! In 2000, we discovered that Shellder can help Slowpoke evolve in a different way! This way is much trickier, and is reserved for a very special Slowpoke indeed. 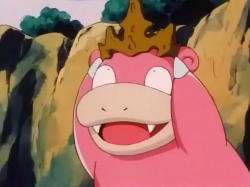 With the aid of a King's Rock and a Shellder bite to the head, Slowpoke can evolve into Slowking! That bite to the head is the obvious tricky part, especially to a Slowpoke in the wild. However is it certainly well worth the effort, as Slowpoke undergoes physical and mental changes. Slowpoke is able to stand on it's hind legs as Shellder changes it's shell into a coil once again, but this time with a more regal look, as it has a red gem in the center. The toxin Shellder secretes from it's teeth has a different effect when directly applied to Slowpoke's head, as it seems to speed up it's thinking and reaction capacity, making them extremely smart, and certainly not slow. To aid the regal look, Slowking also has a special red and white-striped ruff around it's neck. Slowpoke is from the original 151 Pokémon from back in 1997. He's changed a lot over the years! For more information, visit these extremely useful and informative sites!